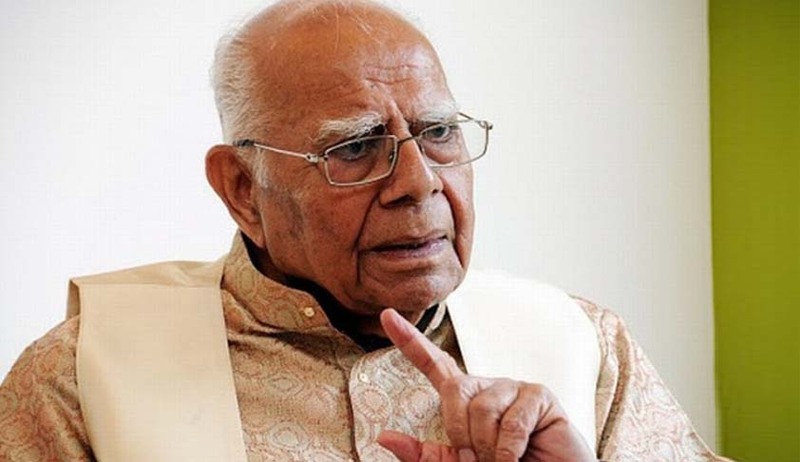 After the marathon midnight hearing on Thursday, Senior Advocate Mr. Ram Jethmalani has approached the Supreme Court in his personal capacity challenging the Karnataka Governor's decision to invite BJP to form the Government in the State, asserting that this is a "gross abuse of constitutional power". A Bench comprising Chief Justice of India Dipak Misra, Justice A.M. Khanwilkar and Justice D.Y. Chandrachud however directed Mr. Jethmalani to make his submissions before the three Judge Bench which had heard the matter in the early hours. He has therefore been directed to appear before the Bench comprising Justices A.K. Sikri, S.A. Bobde and Ashok Bhushan, which will be hearing the Petitions filed by the Congress party and the Janata Dal (Secular) (JD(S)) on 18 May. Aggrieved, the two parties then knocked on the doors of the Apex Court. However, the Supreme Court, in a pre-dawn hearing today, refused to stay the swearing-in of B.S Yeddyurappa as the Chief Minister of Karnataka and directed the legislators from the two parties to produce the letter sent to Governor showing majority before the Court on Friday. You may read an account of the hearing here.